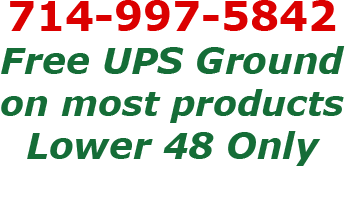 We use UPS to get your order to you as quickly as possible for all products. This takes 1 to 8 working days, depending on how far you are located from our warehouse. We cannot ship by UPS to a P.O. Box address. Please supply A CONFIRMED STREET ADDRESS for delivery. TO SPEED YOUR ORDER, 2nd Day or Next Day services are available. Alaska , Hawaii and U.S. territorial islands must be shipped UPS 2nd Day Air. Shipping rates quoted on request. Rush/2nd Day Service: UPS 2nd Day service is available for shipping for an additional fee. For Next Day or Next Day Saver shipping charges for rush service MUST be in to our office by 12 noon to allow processing time for same day shipment. All orders received after 12 noon will be shipped the following day unless confirmed over the phone. For Next Day Air or Next Day Air Saver are quoted per order.